From Haunted Houses and Spook Walks, to Zombie Hunts & Shootouts, Haunted Corn Mazes and Hayrides, the Halloween Season here in Virginia has so much to offer locals, no matter where in The Old Dominion you reside. With an enormous amount of haunted attractions, it's not always an easy task to choose which ones you and your bravest friends will take on. To make things a bit easier for Virginia haunt goers, Haunts.com has created a list of Must See Haunted Attractions throughout the state. These attractions have received a number of great reviews from customers who experienced the heart pounding fun for themselves, along with outstanding ratings for the 2017 Halloween Season. Check out the list below and start preparing for your 2018 haunting journey! Haunted Nightmares is a super intense, high-energy attraction that offers over 4,600 square feet of space to make your heart race! Featuring the latest technology, fully trained scare actors, detailed sets and horrifying makeup, this haunt offers of plenty of thrills and chills for Winchester locals during the Halloween Season. Be prepared as you journey through Haunted Nightmares, you never know who or what you may come face to face with. It's safe to say that its name probably gives a pretty good description of what you may run into though - that's right, characters straight from your very worst nightmares! Located on Edenton Road in Partlow, the Haunted Hill Haunted Trail and Hayride offers of some serious scares for thrill seekers to enjoy during the haunting season. There's a Carnival Clown Freak Show, Haunted Hayride, Mazes, Haunted Houses, flesh-eating Zombies and more! Will you and your friends be able to handle the horror that awaits at Haunted Hill? There's only one way to find out! The Death Trail of Dumfries brings visitors on a terrifying trek through the deep, dark woods that are infested with mad monsters of all kinds. From demented clowns and hungry zombies, to truly insane creatures that are dying for a taste of their next victim, this haunted trail is jam packed with scary good fun. Be sure to check it out this Halloween Season! This not-for-profit haunted attraction is located inside The Paxton Manor, a real life haunted house that has had some eerie stories attached to it. During the Halloween Season, the creepiness gets brought to a whole new level with Shocktober. Featuring two haunted attractions, visitors can take on the Manor, along with the Carnival of Souls, which offers heart-pounding fun in the basement of the house. Will you be able to handle both attractions? Boasting over 40,000 square feet of pure terror, Gravensteen Haunted House is a unique attraction that is full of thrills and chills around each corner. With high-quality actors, makeup artists, set designs and themed background stories, even the bravest of thrill seekers are sure to be screaming for their lives! Are you ready for the horror that awaits? Spooky Acres Haunted House is an annual event that benefits the March of Dimes, and has been scaring Norfolk locals for over 20 years. Make your way through the macabre scenes, which include a terrifying Autopsy Room and electric chair and enjoy the thrills behind each turn of the haunted maze. And what better way to enjoy scares than to support a great cause at the same time?! The Haunted Hun Club Farm offers a scary good Halloween Festival each year, which features three main attractions, including the Haunted Hayride, Village of the Dead and Field of Screams. Each attraction offers up spooky scares of all kinds, and have the creepiest creatures of Virginia Beach lurking throughout! Don't miss out on your chance to enjoy what this Halloween Festival has to offer. Lynchburg's Scaremare offers a 40 minute experience for groups to take on, which includes a fun house room, creepy trails and dark woods, before entering the House. Once inside the haunted house of Scaremare, visitors will take on a whole other set of thrills and chills! And you never know who you may meet while on your adventure, so prepare yourself! Located on Scottsburg Road, this House of Horror is a not-for-profit haunt that offers up scary good fun for locals during the Halloween Season. Make your way through the house and explore each room that features different scares than the next, and meet the monsters that reside there, awaiting their next visitors... or shall we say victims?! Experience the ultimate fright this Halloween Season by visiting the Haunted Temple in Norfolk! Explore the twisting hallways of the Temple of Doom, haunted by spirits long dead and hideous creatures who have abandoned their tombs - but beware the deadly Mummy's Curse! If you can survive the Temple, you move on to the next attraction, the Zombie Apocalypse and then the Maniac Maze in 3D! Located at the Shenandoah Hills Campground, take a hay wagon ride through the eerie Haunted Woods and then enter the Kreepy Maze and wander the halls and expect the unknown. Anything can happen as you venture through the maze, and you never know who you'll meet along the way! After exiting, visitors will take the hay wagon back to the starting point. 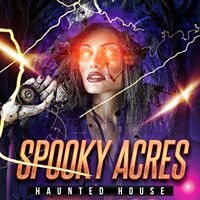 Looking for More Scary Good Fun in Virginia? Check Out Haunts.com's Virginia Haunted House & Attraction Guide Here!